So I picked up the cheap ($30 or so) Record Doctor clamp from Audio Advisor. I fail to understand how the clamps that cost many times more are worth the extra $$. I get it that other gear may warrant extra $$(amps, speakers, etc) but a clamp that seems to fill the intended purpose isn't really all that complex, is it? In any case, for $30 this thing seems to be fairly well built and does the job for me. I bought a clever clamp a few years ago and it does the job for me. It is only used for LPs the need help however. I've got into the habit of using the clamp all the time. But it still escapes me what the much more expensive ones have to offer that this fairly cheap one does not. Does it lift the center of the LP up, while pushing down on the LP while at the same time, grasps the spindle, lifting it up to completely couple the LP to the platter? If so, I would imagine just a difference in tone and lower register playback differences. I guess this is where the difference is. Doesn't lift up or push down. Simply clamps to the spindle. I apply a bit of downward pressure before turning the knob to grasp the spindle. Maybe one day I'll spring for a higher end one and listen for any difference. I for one, don’t have a clue. Could someone clearly explain? I thought the definition of couple was to join or link two things together. If you lift the center of an LP up, how is it linked or joined to the platter? How do you lift something up while pushing down? If the clamp is lifting the center, I envision the LP with a shape similar to a contact lens. I can picture the outer portion coupled to the platter but not the inner portion. Wouldn’t such a scenario create tonal difference between the beginning of playback and the end of playback? The one I have (VDG), which mimics The Clamp, uses a spacer (appropriately sized to compensate for any platter pad thickness plus a little more) to slightly lift the center of the LP before the clamp is applied. When the clamp is tightened, the collet "pulls" on the spindle, this applying downward pressure to the outside edge of the clamp and forcing the LP to lay flat on the platter. So a contact lens is a good, if not exaggerated comparison. A clamp is most useful for warped vinyl. I use a clamp every time I play a record. I use a Michell clamp, which looks to be similar (in price and operation) to many others, except that a small felt ring is placed over the spindle and sits around the base, underneath the record. I push down on the clamp before tightening. It's more effective on some turntables than others. For example, old changer tables where the spindle can be swapped between single and multi-play don't work very well with clamps since the spindle and clamp will just pull right off even when tightened. A weight would be better than a clamp in this case. Of course this is with the single play spindle...can't put a clamp on a tall multi-play! As far as what purpose they serve, I see it as two-fold. One is to help flatten warped records. Newer vinyl pressings of 180 or 200g are so thick that they don't really warp, so the clamp may not be necessary. But older, thinner records can have warps, so a clamp can help flatten them...a bit. Second purpose IMO is that the clamp (sort of) couples the record to the platter. Heavier platters are better than light ones, but either way, the clamp attempts to make the record part of the platter, and sort immobilize it for more solid playback and response, particularly in the bass department. That's my two cents FWIW. Using one is part of my routine, along with the cleaning/brushing process for vinyl and stylus. 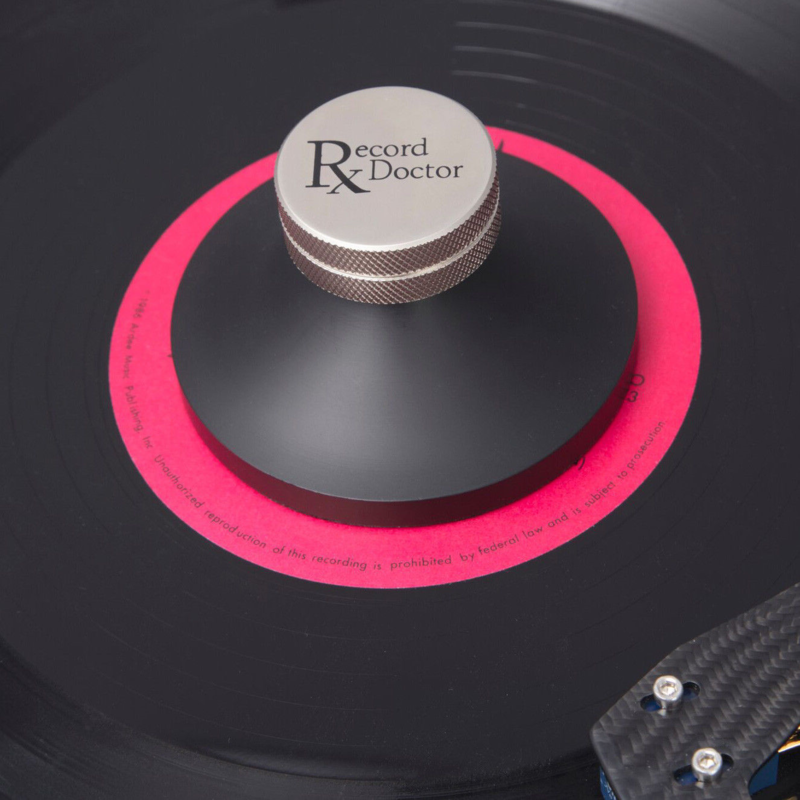 I use the Record Doctor clamp. 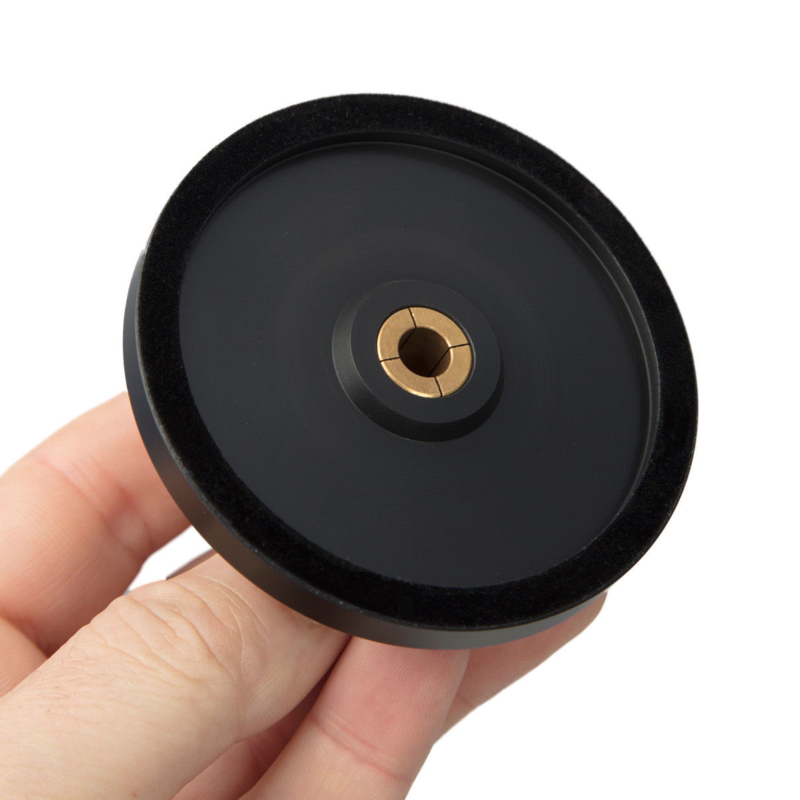 To lift the center of the record while using a little downward force while clamping, I bought a few difference thickness neoprene fender washers (about 2.5-3.0" diameter with .25" center hole) at the hardware store. 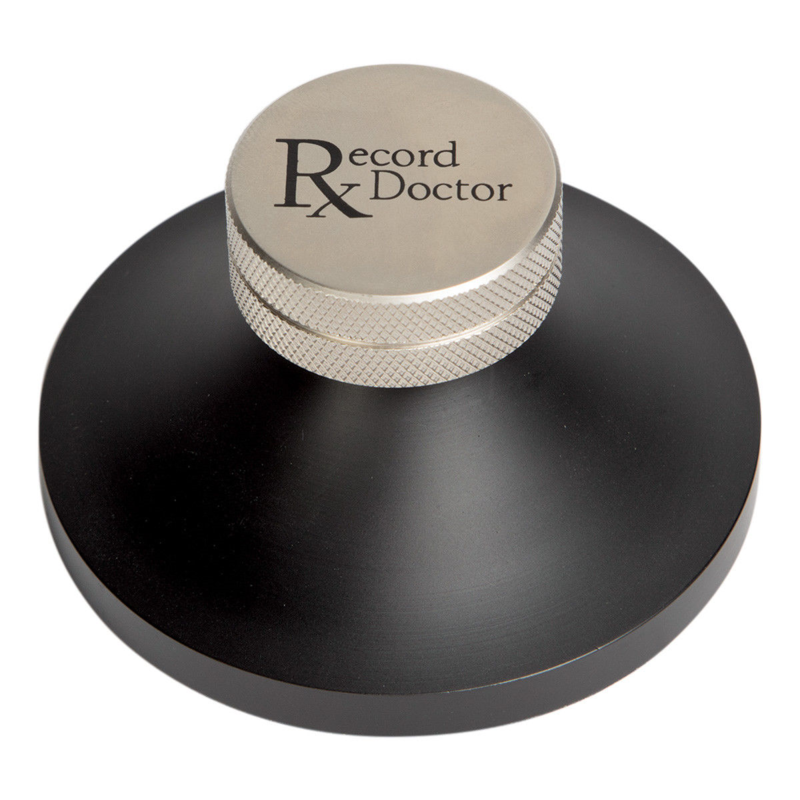 Put one under the record label before clamping (the more the record is warped, the thicker the disc) and the record is secure to the platter and level. I could eat on my plates from college, or my mother's fine china. Both serve food equally well. One is just considered to be nicer. Has a nicer weight, nicer details, nicer feel. All that jazz. That's the main difference I'd expect with various record weights. Just different materials and designs, but functionally the same. On the extreme technical end it could be argued that using more exotic material with extremely tight manufacturing tolerances could also help with absorbing, isolation, yadda yadda. But I would shocked if 1/1000 people could tell the difference in any system. I don't even have the TT setup some on this board have and I can tell a difference between all 3 record clamps I have. That is very discernible. I would only imagine it would grow exponentially more discernible with a top end TT setup. This goes for not only regular LP's but 180/200g as well. YMMV, FWIW. I was wondering if clamps mar the spindle in any way? I would think something that "clamps" around the spindle would have a pretty good chance of leaving a mark. Me either. I just used a magnet to confirm on a few of my spindles, and they are steel. The clamps I have are aluminum. The original The Clamp and the copy Larry made use a brass collet, so being softer than a spindle definitely are not going to leave a mark. Thanks for all the responses. I would like to try a clamp (why not, right?) but I would like to ease my toe into the water. Anyone recommend a low price model - but one that still can offer the benefits that a clamp can offer? i.e. I don't need one plated in 24k gold, but do want one that does the job. Clearaudio clever clamp is about the cheapest one that works that I've seen. I use a weight on mine. Works good for me. Only 180g badly warped records don’t lay all the way flat with it. Ad I only have 1 or two of those. The one I have is about the cheapest to the best of my knowledge. Collet is brass, does not weigh much(important to me). So far, none of the records I have are warped much so can't speak to that, but is does couple the record to the mat. Have not noticed any sound difference with or w/o the clamp. Oh, OK. Not too spendy at all. I'll give it a shot. Thanks for all the inputs!